It’s that time of year again — the time when many of us need to worry about vitamin D deficiency. If you live north of Georgia, the days are getting too short to provide enough sunlight, especially since most of us are not inclined to be wearing clothes that expose our skin to sunlight this time of year. If you suffer from overall muscle soreness or if you’ve been diagnosed with fibromyalgia, dysthymia, degenerative joint disease, arthritis, chronic fatigue syndrome, auto-immune conditions, and other diseases, you should check out the blog post I wrote about vitamin D deficiency last year. If you’re already convinced of the need for supplementation during this time of year, check out this give-away sponsored by Garden of Life. 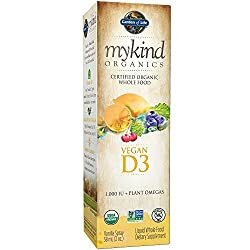 They’ve agreed to give three of my readers a two-ounce bottle of Garden of Life myKind Organics Vegan D3 Spray. One squirt contains 1000 IU of vitamin D3 in a vanilla-flavored oil, which makes sense because vitamin D is fat soluble. Like other myKind Organics vitamins, it is organic and certified GMO-free. It is also vegan. Dec. 2 update: We’ve had such a great response to this give-away, and I’ve been so moved by the comments already left, that we’ve decided to increase the number of bottles to FIVE that we’ll be giving away! You can enter the giveaway as long as you have a US street address where Garden of Life can ship the supplement if you win. I know that living in western PA that we do not get enough sunshine. I would love to win this supplement. I had a vitamin D deficiency last year so bad I was on a prescription for D3 for about 6 months. It would be great to win this !!! This article focuses on how the conscious and unconscious mind work and in particular, the mind-blowing power of the unconscious mind. It explains how this force can work both for you and against you, depending on your beliefs. A must-read for anyone wanting to be the best they can be in their business and personal lives. Would love to win this. I think it would help a lot. I could use this, certainly not enough sunlight this time of year. I would love to win because I have a lot of physical problems that stop me from being able to go outside hardly ever, this would really help what with winter coming and all. I live up on Lake Erie, and it is so dark here year round. I like Garden of Life products and can always use more Vitamin D! I have been meaning to try this since your post on it last year! My husband always gets seasonal depression (though he will not admit it) and I know I get super sluggish too. I bet this would help a whole lot! I need to increase my Vitamin D to help with thyroid disease. You also need to click on "leave a blog post comment" in the box above. Thanks for entering!